The Women’s Visionary Congress (WVC) is an annual gathering of visionary women healers, scholars, activists and artists who study consciousness and altered states. The WVC supports the transfer of knowledge among women who apply the insights of their research and spiritual path. We gather on beautiful land in Northern California to renew our community of adventurers and visionaries. The fifth annual WVC will take place from July 29 – 31, 2011 at the Institute of Noetic Sciences (IONS) Earthrise Retreat Center, near Petaluma, California. The WVC welcomes interested women and men to join us as we talk, dance, eat delicious food and participate in a series of conversations with wise women. Presenters include Copperwoman, Valerie Corral, Earth and Fire Erowid, Dorothy Fadiman, Amber Field, Carolyn (Mountain Girl) Garcia, Dorka Keehn, Jessica Lucas, Mariavittoria Mangini, Jean Millay, Eleonora Molnar, Annie Oak, Linnae Ponté, Miss S, Nick Sand, Stephanie Schmitz, Jane Straight, Justine Willis Toms, Keeper Trout, Clare Wilkins and Nina Wise. 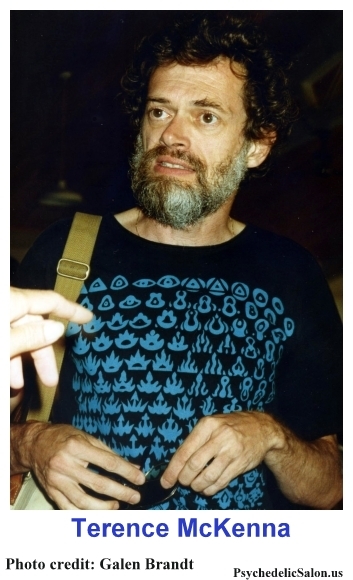 Posted in Culture, Language, Psychedelics, Terence McKenna (mp3). Lozo, what have you done? Do you realize how many people are just itching to attend a conference hosted by you and Bruce? I for one will surely be there and am fighting off the urge to purchase tickets to Seattle for the last week of September before it’s announced. Please provide more detail so I won’t miss the boat. I wonder the same as meehoo… if anyone knows what or where this shirt exists, It would be much appreciated. I wonder where Terence got this T-shirt from, it’s just marvellous. wow this was a really good podcast, one of my favorites so far. I’ve been longing for this thanks for sharing it to us.